"The book is excellent. Judging it by its account of controversies in which Power Line played a role — Rathergate, the talking points memo, Krugmania, the Haifa Street photo — it meticulously reconstructs several of the most interesting engagements of the blogosphere and the mainstream media." Who’s Watching the Watchdog, Anyway? Just ask CBS News. In 2004, the network came into possession of allegedly authentic National Guard documents which claimed that President Bush had failed to perform his duties when he was in the National Guard during the Vietnam War. But the documents were forged, and bloggers, not the media, broke that story. This little book is not intended as either an endorsement or a criticism of the ideological or political views of any bloggers ... Instead, this work is intended as an exploration of the distinct types of media criticism which have evolved in the blogosphere, and it does make the argument that the blogosphere, as an emergent social object in itself, is a constructive addition to the media mix. 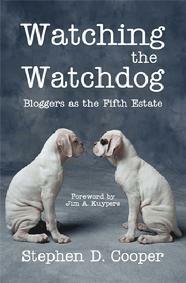 So ... we might now be seeing the emergence of a Fifth Estate in our social system, a watcher of the watchdog. In one sentence, the thesis of this little book is that the blogosphere is in the process of maturing into a full-fledged social institution, albeit a non-traditional one: emergent, self-organizing, and self-regulating. Stephen D. Cooper (Ph.D. Rutgers) is associate professor of communication studies at Marshall University, where he teaches courses in media and society, business and professional communication, computer-mediated communication, and group communication. He is author or coauthor of articles published in Qualitative Research Reports in Communication, Review of Communication, The Kentucky Journal of Communication, The American Communication Journal, and The New Jersey Journal of Communication.